Over the busy-ness of the last 6 months, and lack of diligence on my part... 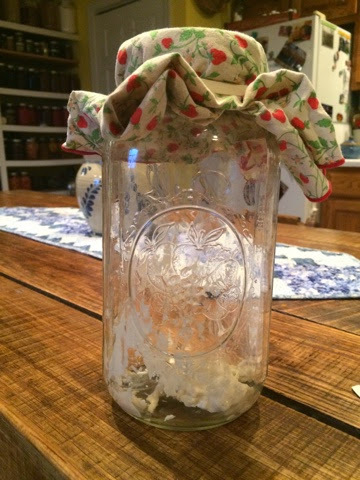 I let my beloved sourdough starter die a slow, painful, stinky death. Sourdough is very hearty, despite what some say. You can bring it back many times when it seems it past the point of no return... but then there is that dark, shadowy place that is far, far, far, FAR past that point and that is where my poor starter went to stay. I had to say goodbye to my starter. 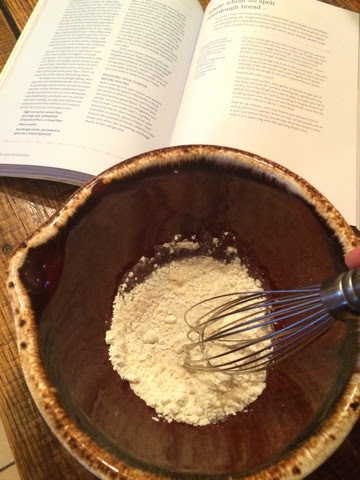 In the past many months, I have wanted to have some sourdough pancakes (our favorite) or some hearty sourdough bread, or even some sourdough tortillas for taco night. Nope... It didn't happen. I decided this morning, I would attempt to fix my conundrum and make my own starter! I've read about it many, many times. I know Ma Ingalls did! 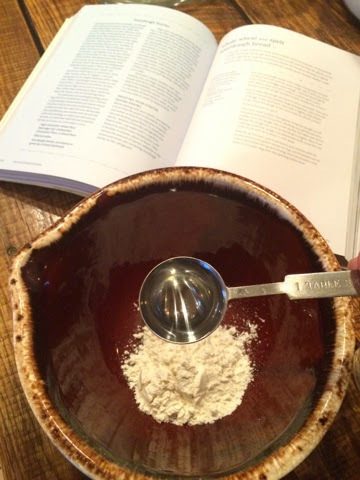 So I got out my copy of The Nourished Kitchen and followed her advice! Cover loosely, you want it to have room to bubble and grow. Sit somewhere that will remind you about it. VERY IMPORTANT! I need to see things to remind myself about them, especially lately... I guess I am getting older. Sigh. In 12 hours, do the same thing again. 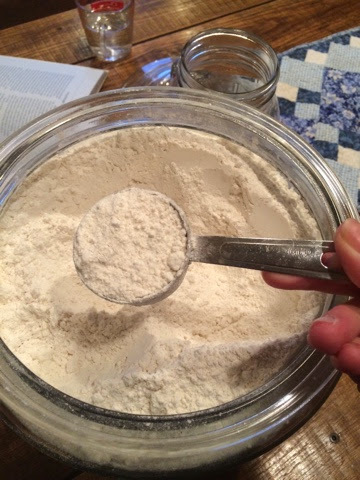 On the next day, whisk 1/2 cup flour and 1/3 cup water into your starter. Do this twice a day until your starter begins to double in volume within 12 hours of each feeding. She says typically it will happen in 3-5 days. 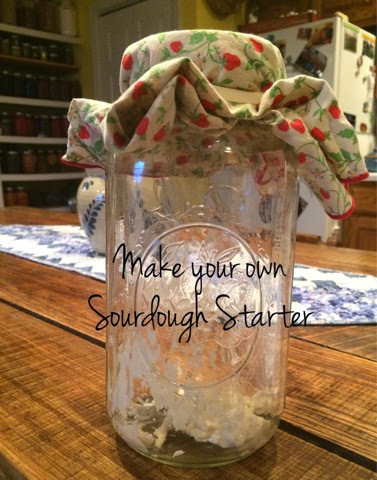 After that, you are ready to use for all your sourdough baking! I will say at this point you can use it, but the more it is used and fed and cared for... the more flavors will develop and bloom. Be good to your starter, and your starter will be good to you. 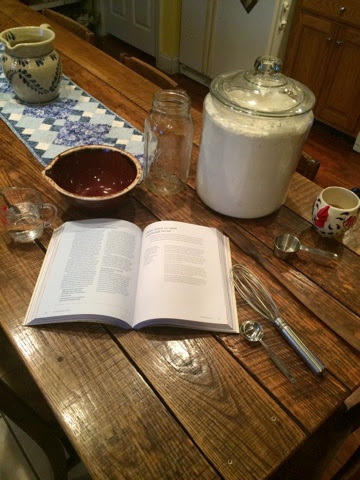 I'm so excited about this, by this time next week, I am hoping for some sourdough waffles! Have a great Friday, friends!!! 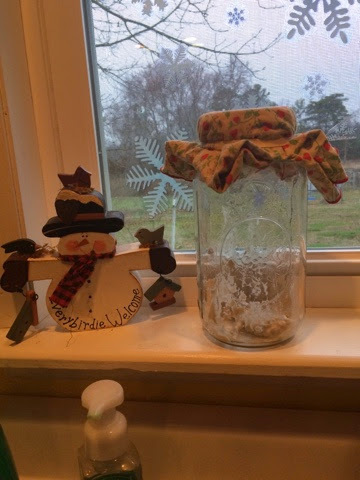 This is the sourdough starter that I make. It works every time. Isn't it great to get yeast out of thin air?